la elección de los fans: Love! Did tu feel happiness when Rom come back? The couple who kisses the Best? I've noticed some Harmony shippers use this quote to support their pairing: 'At once, Hermione Granger's voice seemed to fill his head...', however the 'shrill and panicky' part is omitted. Why? Why do tu support Harmony? Post a picture of what tu think Hermione's wedding dress would look like? Well, many have been thinking: Why should Harry and Hermione end up together? 1. Ginny is nearly a carbon copy of Harry's mother, and normally, you'd not want to end up with someone like your mother. It's disgusting! As if you're besar your own mother. 2. Even though the cine mostrar más chemistry between Harry and Hermione, Hermione and Ron, in the books, always fight about at least one thing in every single book. I decided to use the word ‘relationship’ for this pair because its the best term to describe them and “charged moments” just the two of them, something special which Harry and Ron do not share nor do Hermione and Ron, its these moments which make Harry & Hermione a relationship that is worthy of its nickname which the fandom has dado to them - Harmony. 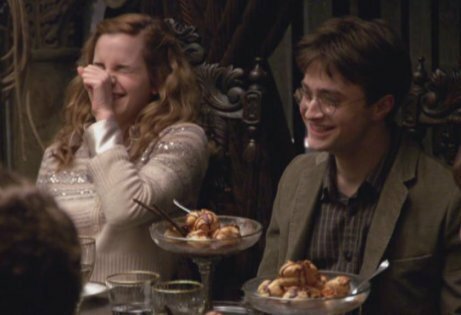 Everyone says Ron is the MOST for Hermione. Hermione and Lily are both bookworm, muggle born, brightest witches of their era. tu can say BUT JAMES AND RON ARE PRANKSTER!!! So, Harry looks alike James and Hermione feels alike Lily. CAN tu SEE WHAT I DO HERE? James has hazel eyes. Just like Hermione. And Lily have esmeralda eyes. Just like Harry. I found this post on tumblr, can't remember the exact blog url so if anyone recognizes it I can add it in the credit/source at the end! Definitely one of my favorito! artículos on Harmony for sure! When asked why I ship Harry/Hermione (Harmony), I realize ‘because they’re perfect for each other’ doesn’t cut it. So here, in semi-order, are the parte superior, arriba 5 reasons I ship Harmony. I understand these will intermingle at points but I’m going to try to keep them as separate as possible. 1. Because they are suited. 2. Because they think on the same level. 3. Because they don’t need parallels, but Lily and James would approve. 4. Because in times of trouble, they reach out for each other. 5. Because they compliment each other. 6. Because Hermione wanted Harry to be a Prefect with her. 7. Because Harry and Hermione have friendship, bravery and love. 8. Because they admire each other. In a new interview conducted por Emma Watson, Harry Potter autor J.K. Rowling drops a bombshell: She’s not so sure she should have put Ron and Hermione together. The shocking revelation came in the new issue of Wonderland, of which Watson is a guest editor this month. The comentarios were obtained por The Sunday Times. Disclaimer: I don't own Harry Potter. JK Rowling does and I don't own the song Lifehouse does, It is what it is! Hermione:Harry of course I'll go out with you! Harry:ok I have to go back to my room it's late. Ron:I hear that tu and hermione are an item now huh. Harry:yea so what do tu care. Ron:what do I care!I care that's my girl. Harry:no it's not tu broke up with her. Ron:I was going to apolegize when I over heard that tu ask her out. Harry just go to bed. Hermione:RON RONELD WEASLEY I AM TALKING TO YOU. Ron:what do tu want to tell me that tu and harry are going to makeout huh. Ron:hermione don't cry but if tu are then I have to tell tu something I like lavender so I'm breaking up with tu for lavender sorry. Hermione:huh sniff tu know what Ron fine I don't care just leave. a comment was made to the article: Harry & Hermione: Why Together? Which movie is this scene from? Harmony picture contest - Round five!